A new report commissioned by the League Against Cruel Sports shows that, despite being illegal for over 150 years there is still a dog fight going on somewhere in the UK every day. Contact the Home Secretary Theresa May asking her to take action on dog fighting. Simply fill in your details on the petition and you will be taken through to a template letter. Dog fighting is incredibly cruel. Organised dog fights can last up to five hours with horrific injuries sustained by the animals involved. Those that don't die during the fight are often patched up using crude methods including supergluing torn ears or stapling wounds closed. Cruel training methods involve putting a smaller ‘bait’ animal – often a cat or a rodent – just out of reach for hours whilst the dog strains against a tether. Eventually, the tether is removed and the dog set on the bait. 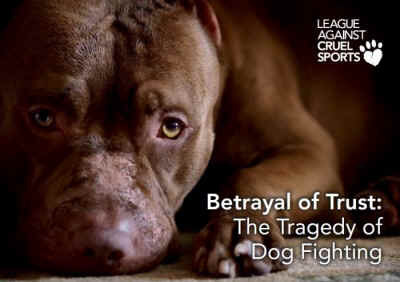 Dog fighting is one of the most barbaric forms of animal abuse that still takes place in the UK. It should have been confined to history alongside bear baiting and cockfighting, yet it still takes place every day.